The iOS version 6.0.2 was available since more than a month ago, and it was available for the various iOS devices such as the Apple iPad, the Apple iPhone, iPod Touch and even the iPad Mini. 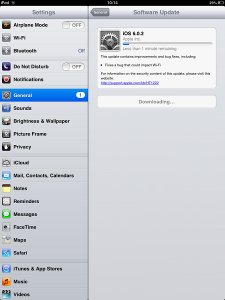 There is always a reason for the various updates being made available by Apple all the time, and this time it is the Wi-Fi connectivity issues that were being faced by the users of the iOS devices, and Apple has figured out that problem and sent the fix for the same through the iOS version 6.0.2. We’ve got the iPad Mini which used to disconnect quite a few times after the automatic connection, and sometimes it totally failed in connecting to a specified Wi-Fi network, but the iOS update would help resolve from the same. 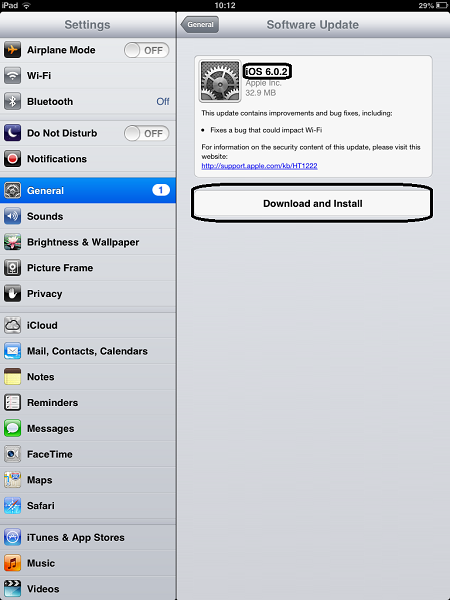 Here is how you can update to the latest version of iOS, i.e. 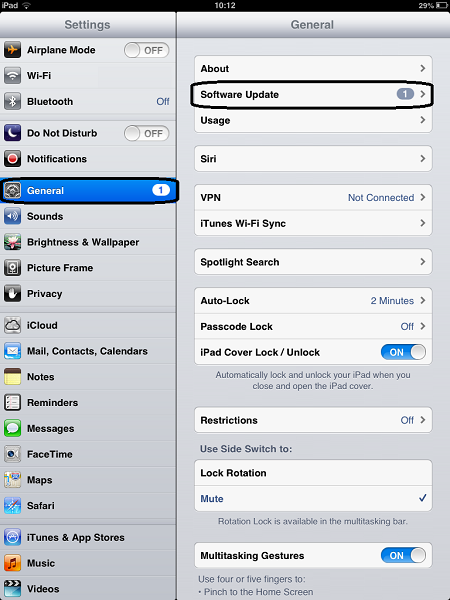 the 6.0.2 on any of your iOS devices, but we are explaining that through the iPad Mini from Apple. You usually get the notification for the update in the Settings area or as a popup but if you don’t, you would need to go to the “Settings” section, where there is a section named “General”. Click on that, and the right bar would have the second option named “Software Update” which will search for any available updates. Once done with the searching, you will see that there is an update available, with the size of 32.9MB, and below that a button – “Download and Install”. Click on that to start downloading the update. 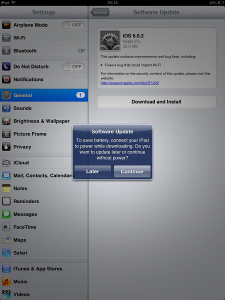 Once you hit the download and install button, you will be shown a popup with the terms and conditions from Apple, on agreeing to which the downloading would start. Ensure that you have more than 50% of battery left in your device, or else you would get a notification as given below in the picture. 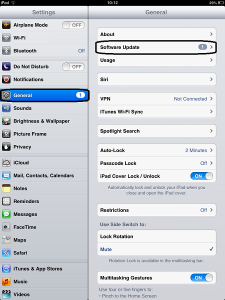 Once connected to the charger, or by hitting Continue on that notification, the download would start and then get verified after the file is downloaded by the iOS device. 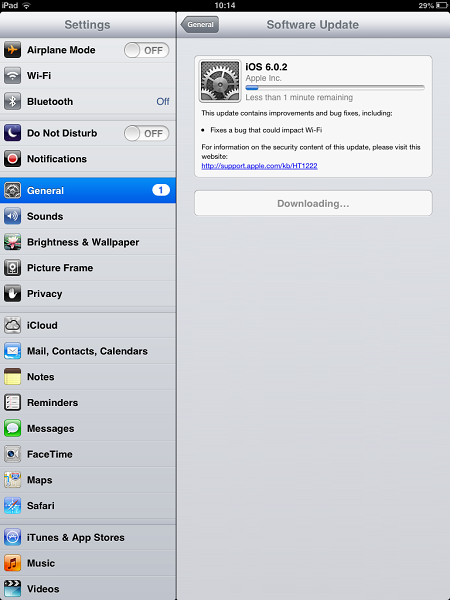 It takes around 3-4 minutes for the downloading and verifying, as although you would be on a speed internet connection, the device needs at least 2-3 minutes for verifying the update. 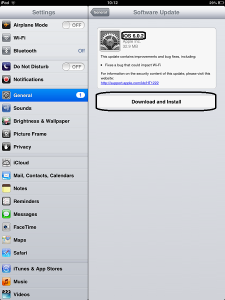 Once done, the next step is installation which will restart the iPad Mini or any iOS device which you are updating and upon restarting the device is update to the latest version, i.e. 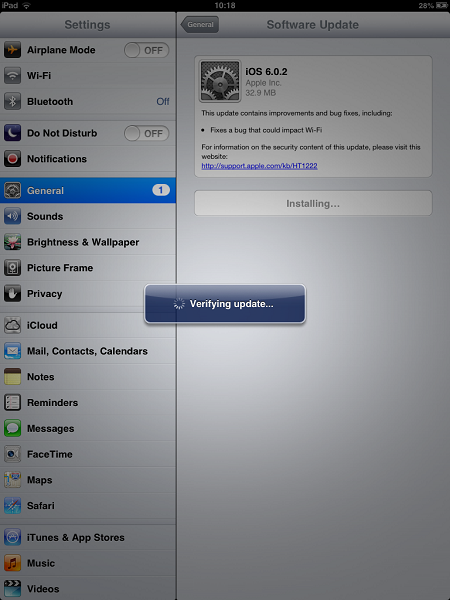 the iOS 6.0.2 version. If the battery of the device is less than 50%, then the installation stops, and it would compulsorily need you to connect the device to the charger for it to continue. 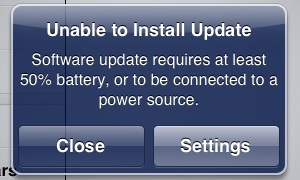 Once the charger is connected, or if the battery is 50% or above, the iOS is updated and the device is restarted, and when you again go to the Software update section, this is the message you get. The same update is available in the iPhone, iPad and the iPod Touch which are all on the 6.0.1 version of iOS, so make sure you check for the updates if Apple didn’t send any notification regarding the same. It is always suggested that you update to the latest version of iOS as soon as possible to ensure a good security to the device.